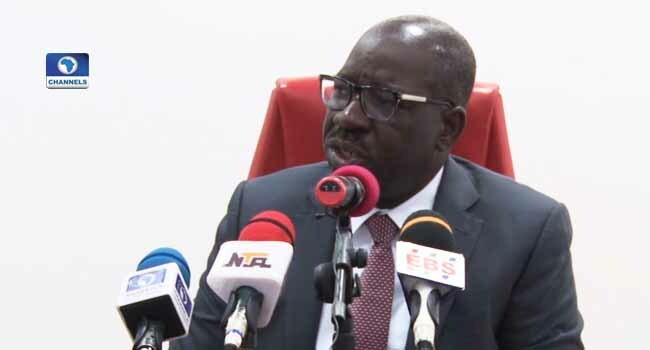 Edo State Governor Godwin Obaseki says his administration has been able to cushion the impact of the nation’s recent economic recession because of the prudent management of the limited resources. He revealed this after swearing-in the new Commissioner for Environment and Sustainability, Omoua Oni-Okpaku, during the weekly State Executive Council meeting on Wednesday at the Government House in Benin City, the state capital. The governor asked the new commissioner to adopt best practice in the management of the environment, stressing that his administration is in a hurry to address the challenges in the sector. He also urged Oni-Okpaku to bring her wealth of experience to make the desired positive change in the ministry. Responding, the new commissioner said she was determined to work in the cabinet, stressing the importance of the environment sector to the state’s economic development. She pledged that the Ministry of Environment and Sustainability, under her watch, would engage youths in the protection and preservation of the environment in line with the government’s ‘Keep Edo Clean’ project and other programmes. Oni-Okpaku was inaugurated following the sack of her predecessor, Mr Reginald Okun, by the governor. Governor Obaseki had consequently forwarded her name as a commissioner-nominee to the Edo State House of Assembly for confirmation.